Senate Democrats today dropped a controversial proposal to ban assault weapons from a gun control bill they plan to introduce on the floor of the Senate in April. The decision to drop ban indicated that Democrats could sense that the overall bill likely had no chance of passing with an assault weapons language included. 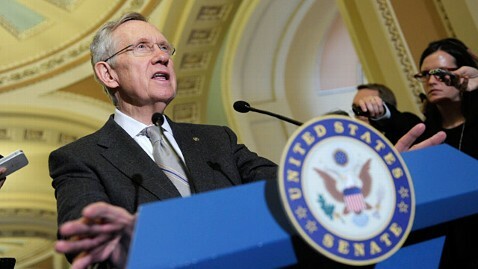 "I'm not going to try to put something on the floor that won't succeed," said Senate Majority Leader Harry Reid, D-Nev. "I want something that will succeed. The worst thing in the world would be to bring something to the floor and it dies there. I am working to put something together than can get 60 votes on the floor." The assault weapons ban will still get a vote. It will be voted on as a standalone measure as an amendment to the base gun control bill. But stripping it off the base bill leaves it vulnerable and decreases the chance of it passing, as it will not receive the same support that it could have if it was bundled with the other less controversial measures. Last Thursday the Senate Judiciary Committee voted in favor of the assault weapons ban bill during their markup of gun legislation. Feinstein today told reporters she was informed of the decision by the Democratic leadership on Monday night and was "disappointed" in the decision and that her efforts at the end of the day were not good enough. The assault weapons ban is just one of the gun measures passed last week by the Senate Judiciary Committee. The committee also voted in favor of a bill to boost school safety money, a bill that would expand federal background checks, and a gun trafficking bill that makes "straw" purchasing - legally buying a gun to give to a criminal or someone not allowed to have one - illegal. Reid is working to determine which measures will be included in the Democrats' base bill and indicated he'd like to get a bill to the floor of the Senate "as soon after recess as I can." The Senate's Easter recess concludes on April 7 .